This training section is aiming primarily towards consultants, but is applicable to everyone in the organization. Even if you are not on customer assignments in the role of a consultant, creating a Profile will include your skills and experience in your organization's skills inventory. This will help your organization to get an overview of which skills and experience that it collectively possesses and which to focus on improving e.g in the form of training or recruiting. 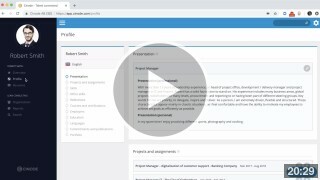 These video are divided into 2 sections depending on which template you have chosen and will show the functionality of our module "Talent Connect". To read more about Talent Connect, please visit our the FAQ under Profiles and Resumes. Prerequisites: These are training videos for customers using the Cinode standard template "Fixed". The final result (Resume) presented at the end of the video may look different if your company has chosen a custom template. The creation of a Profile and functionality of creating a Resume is the same regardless of which template you have chosen. For questions regarding how your custom template works, please contact your the Cinode administrator in your company for more information. Prerequisites: These are training videos for customers using the Cinode standard template "Flex". The final result (Resume) presented at the end of the video may look different if your company has chosen a custom template.